These document(s) are designed for a transaction where the commercial landlord consents to a sublease of the premises, and confers certain nondisturbance rights in favor of the new subtenant. Included provisions also permit certain alterations to the premises by the subtenant, allow the subtenant to exercise a renewal option, and alter the rent payable by the subtenant during the term of the sublease. A. Landlord’s predecessor in interest, Landlord’s Predecessor, Inc., a __________ corporation, as landlord, and Tenant’s predecessor in interest, Tenant’s Predecessor, Inc., a _______________ corporation, as tenant (Tenant), entered into a lease dated _________ (Master Lease) whereby Landlord leased to Tenant the Lot, including the Building containing approximately _____________ rentable square feet (Premises) located at ________________________ (the Building), as more particularly described in the Master Lease, upon the terms and conditions contained therein. All capitalized terms used herein shall have the same meaning ascribed to them in the Master Lease unless otherwise defined herein. B. Sublandlord and Subtenant wish to enter into a sublease to sublease the Premises on the terms and conditions hereafter set forth (the Sublease) and Landlord wishes to consent to the Sublease and grant certain rights to Subtenant all as more particularly set forth herein. C. _________________ is guaranteeing the obligations of Sublandlord to Subtenant. (a) Landlord hereby consents to the Sublease. (b) Landlord certifies that, as of the date of Landlord’s execution hereof, and to the best of Landlord’s actual knowledge, without any investigation of the premises, Tenant is not in default or breach of any of the provisions of the Master Lease and that the Master Lease has not been amended or modified except as expressly set forth in the foregoing Sublease. (c) Except as and to the extent expressly provided in the Sublease and this Agreement, the Sublease shall be subject and subordinate at all times to the Master Lease. (d) Nothing herein contained shall be construed to (i) modify, waive, impair or affect any of the provisions contained in the Master Lease (except as may be expressly provided herein) or (ii) waive any future breach of, or default under, the Master Lease. (e) Tenant shall be and remain liable and responsible for the due keeping, and full performance and observance, of all of the provisions of the Master Lease on the part of Tenant to be kept, performed and observed during the initial Term of the Master Lease, including, without limitation, the payment of Base Rent and Additional Rent (as such terms are defined in the Master Lease), but Tenant shall have no liability or responsibility with respect to the provisions of the Master Lease during the Extension Term unless Tenant, and not Subtenant, exercises the option with respect to the Extension Term. (f) Simultaneously with its execution of this Consent, Subtenant shall provide Landlord with a copy of a certificate of insurance meeting the requirements set forth in the Master Lease and providing the same insurance coverage required to be obtained by Tenant under the Master Lease as to both the types of insurance and the amounts of such policies. Landlord and Tenant shall each be listed as a named insured on such policies as and to the extent provided in the Master Lease. (g) Immediately upon declaration by Landlord of an event of default by Tenant under the Master Lease and notification by Landlord to Subtenant that an event of default has occurred with respect to Tenant under the Master Lease, Subtenant shall attorn to Landlord. Tenant hereby consents to the direct payment of all Rent to Landlord. (h) Upon Subtenant’s receipt of written notice from Landlord that Landlord is exercising its right of recapture, as provided in Section 21 of the Master Lease, Landlord shall assume all obligations of Sublandlord under the Sublease, Sublandlord shall deliver the original Letter of Credit to Landlord and Subtenant shall release Sublandlord from any claims under the Sublease occurring or arising thereafter. (a) As between Subtenant and Landlord, Subtenant shall have the same rights and be subject to the same restrictions with respect to subletting and assignment that are set forth in the Master Lease and are applicable to Tenant. (b) Landlord has approved the alterations specified on Exhibit B attached hereto and incorporated herein by reference (Approved Alterations) which Subtenant may, in its discretion, make to the Premises, provided that the Approved Alterations are performed in accordance with the terms and conditions of the Master Lease regarding alterations. Landlord agrees that the Approved Alterations may remain in the Sublease Space upon the expiration of the term of the Sublease and Subtenant shall not be required to restore such areas. Tenant shall provide drawings and plans for the Approved Alterations prior to commencing such construction for Landlord’s review to confirm that such construction does not expand the scope of the Approved Alterations. (c) Landlord consents to Subtenant’s use of Tenant’s existing emergency generator provided that Subtenant shall use such generator in compliance with all applicable laws, including Environmental Laws. (d) Landlord agrees that Subtenant shall have the right to exercise the Extension Term of the Master Lease pursuant to and in accordance with the terms of Section 33 of the Master Lease and in the event that Subtenant exercises such option, Landlord hereby covenants and agrees that Tenant has no further liability under the Master Lease and is unconditionally and irrevocably released from all of its obligations and liabilities accruing or arising during the Extension Term, including all monetary and nonmonetary obligations without further notice of any kind or nature.. Landlord hereby agrees that in the event Subtenant exercises the Extension Term, and Subtenant defaults under the terms of the Master Lease at any time during the Extension Term, Landlord shall look solely to Subtenant to satisfy any damages that result from the event of default. Under no circumstances shall Tenant be liable to Landlord for any damages or shall Tenant be required to cure any event of default of Subtenant occurring during the Extension Term. Landlord agrees that Subtenant shall have the right to exercise the option to extend the term of the Master Lease pursuant to and in accordance with the terms of Section 33 of the Master Lease (except as modified herein) and in the event that Subtenant exercises such option, Tenant shall have no liability under the Master Lease for any obligations accruing or arising during the Extension Term. Notwithstanding anything in the Master Lease to the contrary, (i) the Base Rent during the extension term shall be ___% of the fair market value for the Premises but in no event less than the Base Rent paid by Subtenant to Sublandlord during the last month of the Sublease term; (ii) the determination of fair market value shall include annual increases in Base Rent during the extension term, if and to the extent that such annual increases are then determined to be components of fair market rent for the extension term; (iii) Subtenant shall provide Landlord with notice of its intent to exercise such option no more than 6 months and no less than 4 months prior to the end of the term of the Sublease; (iv) Subtenant shall, concurrently upon exercising the option, pay to Landlord a security deposit of $_____________; and, (v) the option to extend shall be personal to Subtenant and any permitted transferees (as defined in Section 37 of the Master Lease) of Subtenant and may not be used by Subtenant if Subtenant has subleased (or intends to do so immediately upon the extension of the term) more than ___% of the Premises or has assigned the Sublease. (e) For the primary term of the Sublease, the fee charged by Landlord pursuant to Section 7 (A) of the Master Lease shall in no event be more than _____ percent (__%) of the base rental rate set forth in the Master Lease, whether or not the Master Lease is terminated. 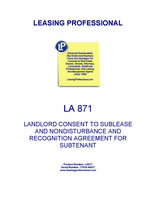 (f) In all provisions of the Master Lease or Sublease requiring consent from the Landlord and Sublandlord respectively, Landlord hereby agrees that any failure of Subtenant to obtain Sublandlord’s consent under the Master Lease or the Sublease shall render Landlord’s consent null and void. (g) Landlord acknowledges that Subtenant shall pay all Rent (as that term is defined in the Sublease) to Landlord in the manner specified in the Sublease, to an address Landlord shall supply Subtenant. Landlord agrees that it shall promptly pay Tenant any Profit (as that term is defined in the Sublease) due and owing Tenant which payment shall be made pursuant to a separate agreement between Tenant and Landlord. Notwithstanding anything in the Sublease to the contrary except as provided in 2(j) below, Subtenant shall be liable to Landlord for late charges imposed under Section 7 of the Master Lease under the terms and conditions stated therein. Landlord and Sublandlord agree that such late charge represents a fair and reasonable estimate of the costs that Landlord will incur by reason of late payment by Subtenant. In addition, acceptance of any late charge shall not constitute a waiver of Subtenant default with respect to said overdue amount, nor prevent Sublandlord nor Landlord from exercising any of the other rights and remedies available to them. Nothing contained in this paragraph shall reduce or eliminate Sublandlord’s obligation to pay to Landlord all Rent and other charges under the Master Lease during the primary term of the Master Lease. (h) Landlord acknowledges that, as between Landlord and Tenant, Landlord, and not Tenant, is responsible for payment of certain Operating Expenses, Tax Expense and Utility Expenses, as those terms are defined in the Master Lease, to the third party provider such services or the applicable taxing authorities. Notwithstanding the foregoing, Tenant is obligated to pay Landlord it share of Operating Expenses, Tax Expense and Utility Expenses (as stated in the Master Lease) for that portion of the 200_ calendar year that falls prior to the Sublease Commencement Date and Subtenant is responsible to pay Landlord for its share of Operating Expenses, Tax Expense and Utility Expenses (as stated in the Master Lease and incorporated into the Sublease) for that portion of the _______ calendar year beginning with the Sublease Commencement Date. Tenant’s and Subtenant’s portions of said expenses shall be prorated between Tenant and Subtenant based on a 365-day year. Notwithstanding the foregoing, Tenant shall not be released of any of its liability for the payment of Additional Rent (as such term is defined in the Sublease) to the extent that Landlord does not receive Additional Rent from the Subtenant. Furthermore, Landlord shall not have any liability to Tenant or Subtenant concerning the prorations stated herein. For purposes of this Agreement, Utility Expenses shall only refer to water expenses. (i) Landlord acknowledges that the Master Lease expires on ____________. (j) Landlord hereby agrees that it shall provide Subtenant with written notice of any monetary default and five (5) days in which to cure such default two (2) times during each calendar year during the term of the Sublease. In the event Subtenant does not pay all amounts owing within the five (5) day grace period, late payment fees and default interest shall be paid to Landlord in addition to all amounts owing. An event of default shall occur if Subtenant fails to pay any amount owing a third time during any calendar year and a late payment fee and default interest shall be paid to Landlord. 3. Termination of Master Lease; Non Disturbance of Subtenant. (iv) The fee charged by Landlord pursuant to Section 5(A)(g) of the Master Lease shall in no event be more than two percent (2%) of the base rental rate set forth in the Master Lease. (b) In the event that Sublandlord and Landlord acquire a right to terminate the Sublease pursuant to the provisions of the Master Lease pertaining to assignment and subletting, then Landlord may elect to terminate both the Sublease and the Master Lease. 4. Copy of Sublease and No Amendment. Tenant and Subtenant represent and warrant to Landlord that the copy of the Sublease annexed hereto as Exhibit A is a true and correct copy thereof and that the Sublease has not been amended, modified or changed. Tenant and Subtenant represent and warrant to Landlord that Tenant and Subtenant shall not, without the prior written consent of Landlord, amend or modify the Sublease in any material manner.